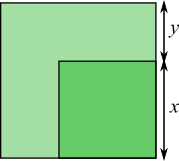 In this diagram, the area of the small square is $\dfrac13$ of the area of the large square. Fibonacci sequence. Golden ratio. Biology. Continued fractions. Quadratic equations. Rational and irrational numbers. Mathematical reasoning & proof. Pythagoras' theorem. Surds. Calculating with ratio & proportion.